Former world junior champion Kai Reus has taken the emotional decision to walk away from cycling, perhaps permanently. The Rabobank rider had a very serious fall while training in the French Alps in July 2007, being found unconscious at the side of the road. He remained in a coma for almost two weeks, but gradually returned to health and, in time, to cycling. He recommenced his racing career in the 2008 Tour of Missouri and continued to build form. He reached a post-accident high point last year when he won the second stage of the Tour of Britain, holding the yellow jersey for several days and eventually finishing fourth overall. However he was subsequently hit by mononucleosis, and had to stop racing until May. Since then, things haven’t gone to plan, although he did finish a solid 35th overall in the Tour of Belgium. "It's just not good," he said on the team website. “There is more going on than I can quickly explain, but I've just had enough of all these setbacks. "I have spent three years fighting to come back. There have been many ups and downs, and I must now look carefully at what I will do in the future." Apart from his junior world championship and success in the Tour of Britain, Reus was also a past winner of the under 23 Liège-Bastogne-Liège. 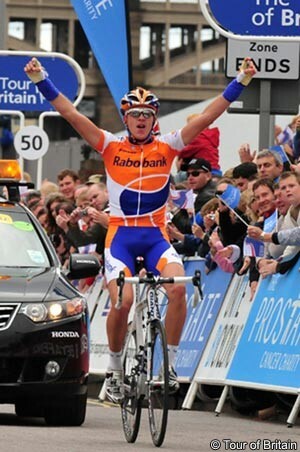 He clearly has a lot of talent, and so his decision is one that his Rabobank team regrets. “After everything he has experienced, it is a difficult but courageous decision to call. In the period after his fall in 2007, several people within the team (among others Adri van Houwelingen, Erik Dekker, Louis Delahaye, Harold Knebel) did everything to help Kai,” said technical director Erik Breukink. “You can now conclude that was unfortunately was not successful and, especially for the rider himself, this is a very difficult final conclusion. “Kai has conceded that the team deserves all the credit for guiding him. His stop is of course no longer so surprising, because there was a long process. He has no longer been at the level he was at last year in England. To be at the highest level, you have to be able to live for the sport and give everything. Unfortunately, after all these setbacks, he cannot. "